“I am here today at The Royal London Hospital, part of Barts Health NHS Trust a well respected large teaching hospital. We are thrilled to be here today to support a surgical training event using our Fundamental Surgical platform. 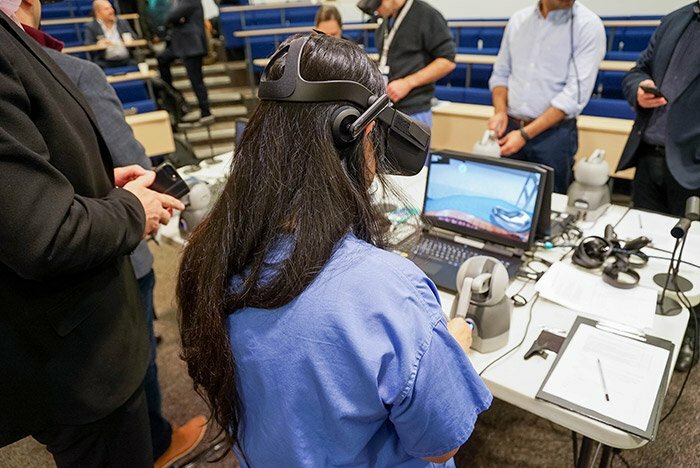 Today, for the first time Fundamental Surgery was used to deliver a Surgical Training simulation lab for Spine Surgery using virtual reality and haptics. 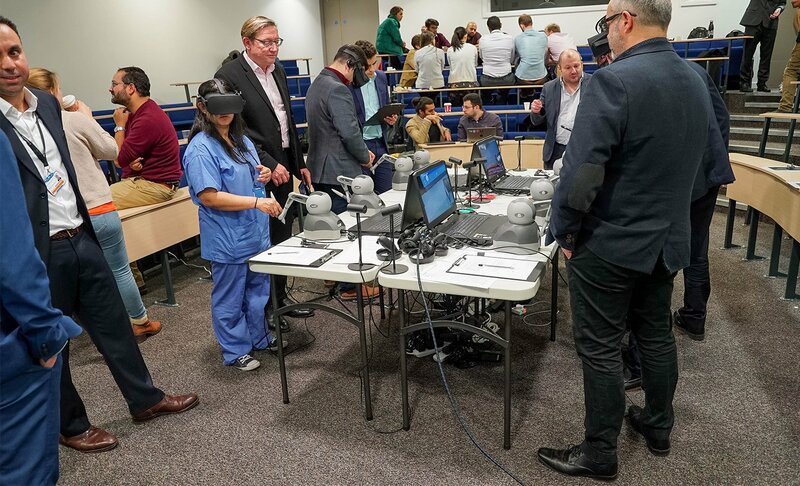 It is a clear sign of a significant trend in the increasing use of simulation for training and demonstrating the real value it can bring to surgical training ‘today’. Today’s lab features our latest spine procedure which involves the placement of spinal pedicle screws. The trainees were immersed in virtual reality standing in the operating room with the patient in front of them. As you can see the high-quality graphics present the patient anatomy in high fidelity. Trainees experienced the feeling of using the probe to develop the pedicle channel and the feeler to check the integrity of the channel to ensure they hadn’t breached the vertebral wall. This is a clear example of how the sense of touch is really important in developing their surgical skills. One of the most important benefits of our simulation is that we can provide immediate data-driven feedback to trainees on their performance. We can measure in real time the angle and depth of the pedicle channel they created and review their performance against the pre-operative plan. As part of today’s event, we collected really useful feedback from the trainees, fellows, and consultants on their learning experience and how we can continue to improve our simulation.